Acu-Tech PE electrical and communications conduit is clearly the material of choice. Used for cable upgrades or rail works, low-pressure HDPE pipe is installed in the ground, typically on the verge or the road, underneath side roads and driveways, and serves as a conduit which allows many cables to be quickly installed or easily upgraded. Advances in cable technologies, as well as the expense of repairing sensitive cable materials like fibre optic cable, have driven preferences for protective conduit over that of direct burial. Acu-Tech Polyethylene (PE) conduit provides mechanical protection to fragile cable materials like fibre optic and coaxial cables, as well as protection from moisture or chemicals and even, in some cases, animals. Furthermore, the permanent pathway provided by conduit also facilitates replacement projects or future installations of additional cable or duct. Acu-Tech supplies 32mm Sub-Duct for running Telstra or Optus cables inside existing conduit. 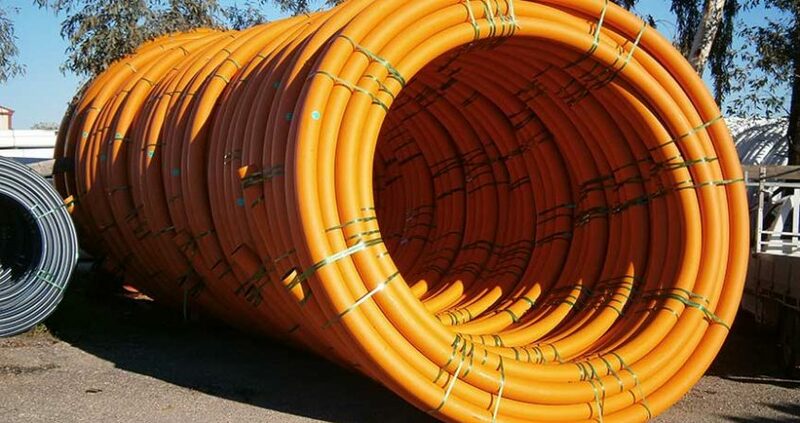 Contact our team for more information about Telstra Polyethylene subduct, which comes in 500m coils. Quote the code SUBDUCT HDPE BK. PE conduit can be installed below ground by a variety of methods, including directional drilling, ploughing, and open trench. Also, its flexibility and availability in continuous coiled lengths facilitates installation into existing conduits or ducts as inner-duct.